What’s in a sterling silver item? If you were given a random item that appeared to be silver, would you be able to identify it? Although many folks have heard of sterling silver, few feel as if they can confidently identify the material in common household items. Since sterling silver is far more valuable than silver plate, it’s important to understand this distinction. Fortunately, it’s possible to identify sterling silver from its markings. Since they’ve been used regularly since the 14th century, there are a dizzying range of silver marks in the world. Many are country-specific. Others are specific to the manufacturer. 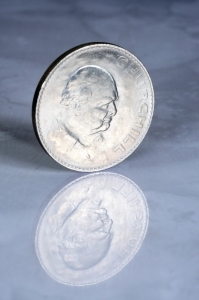 While many silver markings are designed to identify the maker of a particular item and ensure authenticity, others simply exist to identify the piece as silver of a particular purity and ensure that it’s valued appropriately. Sterling silver isn’t used as often as it used to be. There are cheaper, more durable alternatives for many of the items that used to be made exclusively of silver. However, new pieces are still manufactured. Even if they’re made by a newer company without a longstanding reputation, these pieces may come with markings that mimic those of the storied manufacturers of yore. This isn’t illegal: The new manufacturers may own the copyright to the name. Alternatively, the copyright may have expired altogether. That said, it’s critical to obtain an appraisal from a trusted expert who can identify authentic and non-authentic pieces to determine whether their antique value exceeds their intrinsic value. Whether you have an antique cutlery set that’s made from sterling silver or a collection of gold jewelry with which you’re ready to part, you need to be sure that you’re getting the best possible value for your investment. At Premier Gold Silver & Coins, we’re proud to offer the region’s most competitive compensation for gold and silver. To discuss your collection or schedule an appraisal, give us a call at (716) 204-8800, contact us online or stop by our convenient storefront location. We use Angie's List to assess whether we're doing a good job keeping valued customers like you happy. Please visit AngiesList.com/Review/7986133 in order to grade our quality of work and customer service.